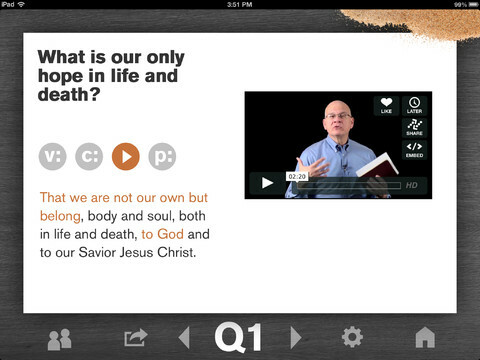 Last year, Redeemer Presbyterian in NYC launched the New City Catechism, with its own free accessible app. For those not familiar, catechisms are uniquely structured clear set of teachings on Christian doctrine. They are very often arranged and written for educating both children and adults in Christian faith. They’re helpfully structured as a series of questions and answers, almost like a manual which can be easily memorised. A. Man’s chief end is to glorify God, and enjoy him forever. Another example is the Heidelberg Catechism, a hugely important historical doctrinal statement. Catechisms have often been written not just to present a clear core doctrinal teaching, but also to make that it plainly known and understood. So why write a new one? Tim Keller points that most people today don’t realise that it was once seen as normal, important, and necessary for churches to continually produce new catechisms for their own use. 1. The first was to set forth a comprehensive exposition of the gospel—not only in order to explain clearly what the gospel is, but also to lay out the building blocks on which the gospel is based, such as the biblical doctrine of God, of human nature, of sin, and so forth. 2. The second purpose was to do this exposition in such a way that the heresies, errors, and false beliefs of the time and culture were addressed and counteracted. 3. The third and more pastoral purpose was to form a distinct people, a counter-culture that reflected the likeness of Christ not only in individual character but also in the church’s communal life. You can read more in his Introduction to the New City Catechism. Their website and app are really helpful. The whole thing has 52 points to match the weeks of the year, and each point has not only a scripture reference, but a commentary excerpt, a prayer, and a short video of someone explaining it clearly. Or you can sweep over the whole thing in one pdf here. In our culture, taking the time to memorise core teachings of the Christian faith is a radical and counter-cultural act of discipleship. It can take that brain space we usually reserve for Simpsons quotes. This is a great way to help ourselves and other people engage well articulated classical Christianity.